I overheard two strangers negotiating camera rights. One woman asked another fan standing in the 2nd row, if she could squeeze in during the concert so she could get a few good photos. "Sure, just give me 10 or 15 minutes to get my Todd fix, and I'll let you in," she told her. (I love Woodstock! Strangers helping strangers.) Tom and I stood close to the stage, a few rows in. Two ladies in back of me asked me to take their photo with their iPhone. Walking through fog smoke, laser lights, Todd Rundgren appeared dressed like a mad space hipster alien, along with his guitarist and drummer. He opened with a strong performance of his new song "Imagination" from his new album State which the crowd went crazy for. After the concert, the two ladies behind us expressed their disappointment with the encore. "I mean, come on. Couldn't he play that hit song the normal way?" she said to me. Tom agreed, but he told her the stage was probably not set up for that. "Oh, well! That's okay. We'll just listen to his CD in the car on the way home!" she laughed. It was a fun night though, and as I listen to the music again, I have a desire to listen to the new State CD. 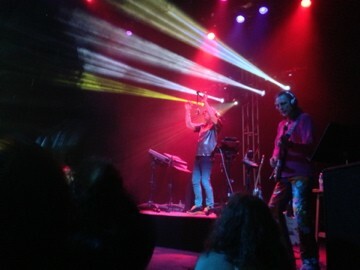 It was a great show, and if you love the techno wizardry of Todd Rundgren, you are in for a treat. If you are hoping for something retro, maybe not. For more Hudson Valley Good Stuff, visit Vanessa Geneva Ahern's blog, HudsonValleyGoodStuff.com.